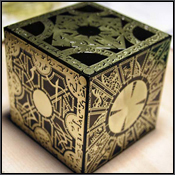 The etched brass and solid mahogany Hellraiser Puzzle Box or Lemarchand Configuration is based upon the original design by Simon Sayce for the Hellraiser movies 1 and 2. Strict specifications are followed with an emphasis on craftsmanship. In the USA: $189.00, Shipping and Insurance are included in this price. Outside The USA(International): $229.00, Shipping and Insurance are included in this price. This is the same box as listed above, but made for wholesale orders. Wholesale Lots are 4 boxes per lot, made to order and take 14-21 days to ship. Discount codes DO NOT apply for this Wholesale Price. If you use a discount code we will charge you the difference and your box will NOT ship until the difference is paid. In the USA: $560.00, Shipping and Insurance are included in this price. Outside The USA(International): $610.00, Shipping and Insurance are included in this price. In the USA: $49.00, Shipping and Insurance are included in this price. Outside The USA(International): $89.00, Shipping and Insurance are included in this price. 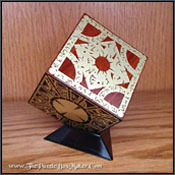 The All Black, Stainless Steel Hellraiser Puzzle Box is etched Stainless Steel, solid Mahogany and lacquered all black. It too is based upon the original design by Simon Sayce for the Hellraiser movies 1 and 2. Strict specifications are followed with an emphasis on craftsmanship. In the USA: $249.00, Shipping and Insurance are included in this price. Outside The USA(International): $289.00, Shipping and Insurance are included in this price. 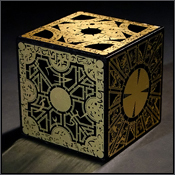 The All Black Hellraiser Puzzle Box is etched brass and solid mahogany, but lacquered all black. It too is based upon the original design by Simon Sayce for the Hellraiser movies 1 and 2. Strict specifications are followed with an emphasis on craftsmanship. These boxes are signed by Doug Bradley, AKA Pinhead, from the Hellraiser Movies. 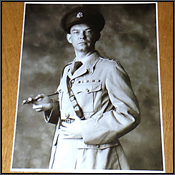 A 4″x6″ Photo of Captain Elliot Spencer and a Certificate of Authenticity are included with each box purchased. 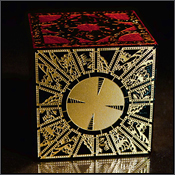 Simon Sayce is the person who originally designed the Hellraiser Puzzle Box for the movies Hellraiser 1 and 2. A note that Simon wrote and signed, several 4″x6″ photos of him signing the boxes and a Certificate of Authenticity are included with each box purchased. The last box is up for auction on ebay. This is a 4″x6″ Lab Printed Photo of Captain Elliot Spencer. The photo was taken circa 1920 while he was serving in the 1st World War. After that he went on to India where he was to purchase a unique puzzle box. It is said he disappeared after purchasing the box and taking it back to his hotel room. Outside The USA(International): $27.00, Shipping is included in this price. You need a glass dome and base to properly display your Hellraiser Puzzle Box, here we offer a 5.5″ x 8″ glass dome with walnut finish base to display your box. In the USA: $14.00, Shipping is included in this price. This bookmark is made with a real film cell from one of several Hellraiser Movies or Trailers. 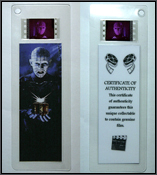 It’s real film cell used and comes with the COA on the back of the bookmark. All bookmarks of of pinhead only, taken from any number of scenes from the movies. 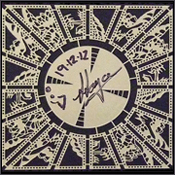 A high quality Lithograph Print Poster of the faces and placement of the Hellraiser Puzzle Box. Outside The USA(International): $42.00, ON SALE: $32.00 Shipping is included in this price. Includes 4″x 6″ Photo of Doug Holding the signed toy!